The Fresno was a 1244 Ton Sailing ship that was built in Bath, Maine in 1874 and served the Atlantic Seaboard until 1914 when she was purchased by the American Pacific Whaling Company. She was reconfigured and used to haul supplies from Seattle north and whale oil from Alaska south. 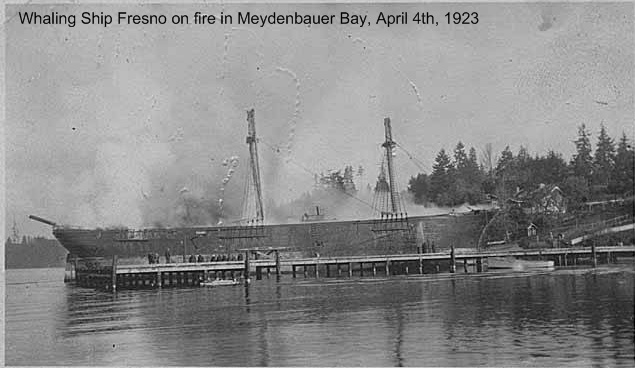 In 1922, the Fresno was beached in Meydenbauer Bay (Bellevue) and used as a wharf for loading and offloading cargo from the winter fleet of whaling ships. On April 4, 1923, the vessel caught fire in the cargo holds, with the whale-oil saturated wood burning fiercely. The steam ferry Leschi attempted to pull the Fresno off the bottom, but was unsuccessful until aided by the whaling steamers Aberdeen, Moran and Westport. 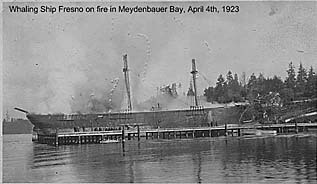 The burning hull was pulled away from the docks in Meydenhauer Bay and left alone until she burned herself out. Once the burned out hulk had cooled, the machinery was removed for scrap and the Fresno was towed out to deep water in the middle of Lake Washington and scuttled in 180 feet of cold fresh water. She lay, on the bottom, forgotten until re-discovered in December 2003 by Innerspace Exploration. Today, the ancient wood hull of the whaling ship lies split along the keel into two 148' long pieces. The ribs are massive and the timbers of outer hull sheathing are incredibly thick. A few deadeyes from her days sailing the world oceans can still be seen attached to the most prominent part of the wreckage. Diving the Fresno is an interesting journey into the past and the days of the great wood sailing ships that plied the trade routes. 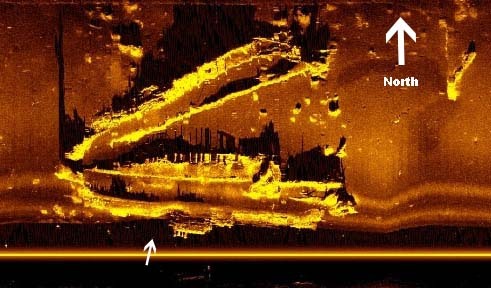 Sidescan Sonar image courtesy of Innerspace Exploration. 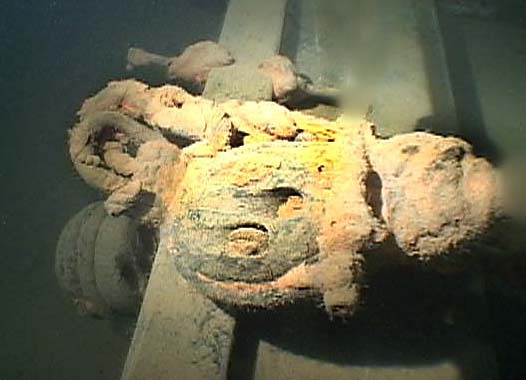 The rudder & stern appear on the left. Deadeyes found just east of the small arrow in the sidescan image.